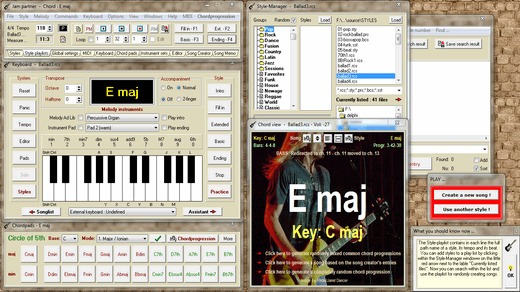 am partner is a MIDI auto-accompaniment software which offers all major features of a high quality MIDI keyboard. It comes with chord recognition, based auto arranger, LeadSheet editor, recording section, up to 16 fingered and 10 two-finger chord types, MIDI-Export, about 30 demo styles and much more. In addition it contains a chord progressions random generator: Depending on various options it randomly chooses matching chords from specific chord groups or it mixes about 100 common chord progressions and generates via one mouse-click complete songs from any number of measures with variations and fills. This makes it an ideal jamming tool and helps to practice a solo instrument in each key with a backing band and countless backing tracks, 'composed on the fly'. Runs from USB stick.